A Kansas museum has opened its doors to a piece of American history. An original copy of the Declaration of Independence is now on display at the Eisenhower Museum in Abilene. The document was discovered behind a framed painting purchased for $4 at a flea market. 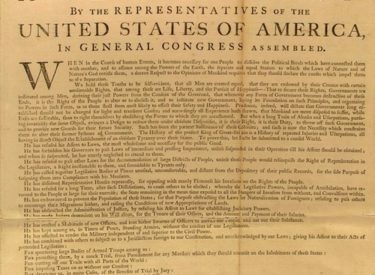 Hollywood producer Norman Lear bought the declaration during an online auction. Eisenhower Museum officials say it’s too easy to just think about it as a piece of paper with words, but seeing it in person reminds you just how important it is to the life Americans now enjoy. The document will be on display for two days only. The Eisenhower Presidential Library and Museum will be open from 7 a.m. to 10 p.m. Tuesday and Wednesday. Admission for adults is $5.